The National Sheep Association (NSA) and Sheep Veterinary Society (SVS) have called for small animal vet practices to join the battle to raise awareness of responsible dog ownership. The two organisations have sent a joint letter to vet professionals encouraging them to display a ‘Stop and Think’ poster in their waiting rooms and treatment areas, so owners will see them when visiting the veterinary surgery. “Sheep worrying causes a multitude of problems for sheep farmers. Not only are we seeing direct injuries from incidences of sheep worrying, but also many indirect, stress-related injuries, such as abortions. The farming community does not always find it easy to engage with dog walkers on the issue of sheep worrying, whereas companion animal vets have a regular audience with dog owners. Even if it’s only for a routine vaccination, owners need to visit their vet at some point, and will hopefully see the poster prominently displayed when they do so. 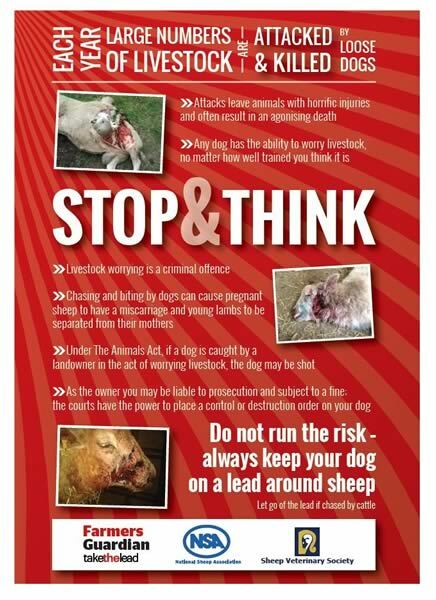 The poster has been produced in conjunction with Farmers Guardian’s ‘Take The Lead’ campaign. Hard copies can be requested by vet practices from NSA on 01684 892661.